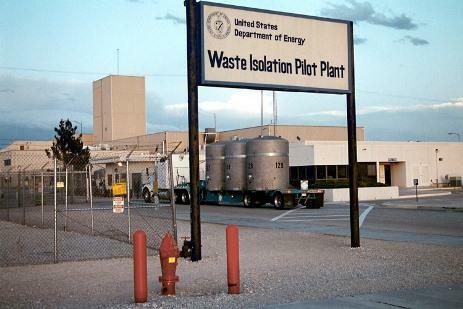 The shipment of transuranic wastes from generator sites to the Waste Isolation Pilot Plant (WIPP) in New Mexico is set to resume in April. The US Department of Energy (DoE) expects a total of 128 shipments to be made to WIPP over the next 12 months. WIPP began operations in 1999 and is the USA's only repository for the disposal of transuranic (TRU) wastes from its military program. The wastes - clothing, tools, rags, residues, debris, soil and other items contaminated with small amounts of plutonium and other man-made radioactive elements - are sealed in drums and disposed of underground in rooms mined out of an ancient salt formation. Operations at the WIPP underground storage facility were suspended in February 2014 following two unrelated incidents. First, operations were stopped following a fire in an underground vehicle on 5 February. Nine days later, a radiological event occurred underground when a waste drum ruptured following an exothermic chemical reaction in organic absorbent material used in the drum to stabilise liquids and nitrate salts. The DoE eventually authorized operator Nuclear Waste Partnership to resume waste emplacement in late December 2016, confirming that all pre-start corrective actions identified in two operational readiness reviews and other required actions had been completed. The first waste emplacement operations were completed on 4 January, with waste from the DoE's Savannah River site which had been in storage at WIPP's Waste Handling Building (WHB). All the facilities that generate TRU waste normally sent to WIPP have in the meantime been storing their wastes on-site while the facility has been out of action. DoE earlier said all recertified waste from the WHB is to be emplaced before WIPP begins accepting new waste shipments. DoE has now announced shipments from generator sites are expected to resume in April. "Shipments from a given site can commence once the site has demonstrated its readiness to load and ship TRU containers and has verified that waste destined for WIPP meets the updated Documented Safety Analysis requirements," DoE said. "The exact allocation and sequence for shipping will be adjusted based on the emplacement rate at WIPP, operational needs at WIPP and generator sites, and logistical issues (such as weather) that affect shipping." DoE has released preliminary estimates for the resumption of shipments of TRU waste to WIPP over the next 12 months. By the end of January 2018, DoE estimates WIPP to receive 61 shipments from Idaho; 24 from Oak Ridge; 24 from Los Alamos; eight from Savannah River site and 11 from Waste Control Specialists. Carlsbad Field Office manager Todd Shrader said, "We are pleased that WIPP is once again emplacing waste. The suspension of disposal operations has posed challenges at DoE sites, with backlogs of TRU waste building up. Resuming shipments from generator sites is important to support cleanup and ongoing missions at those sites. We look forward to doing that as soon and as safely as possible."